Farrar, Straus and Giroux (BYR), 9780374383039, 40pp. A preschooler marks the progress of her day, not by the clock but by what happens after lunch, after nap, after swimming, after the library - and after Daddy comes home. She doesn't map her neighborhood by street signs, either. Her morning walk to see dogs in the park takes her past the cat outside the deli, past her friend Errolyn's building and the daycare where she used to go when she was little, and down the block to the bagel store. 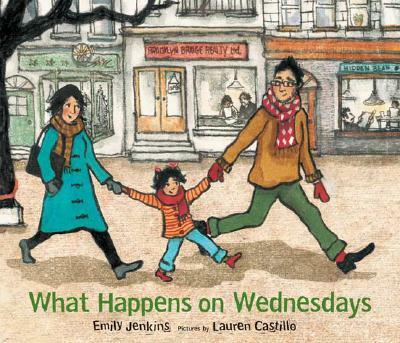 The sounds, tastes, smells, and sights of a multiethnic Brooklyn neighborhood, as seen through a child's eyes and captured with enchanting pictures by debut illustrator Lauren Castillo, will encourage children to make their own sensory maps and list the events in their daily schedules. EMILY JENKINS is the author of many acclaimed picture books, including two "Boston"" Globe"-"Horn Book" Award Honor Books, "Five Creatures" and "That New Animal." She lives in Brooklyn, New York. LAUREN CASTILLO received her master's degree from the School of Visual Arts in New York City and also lives in Brooklyn, New York.